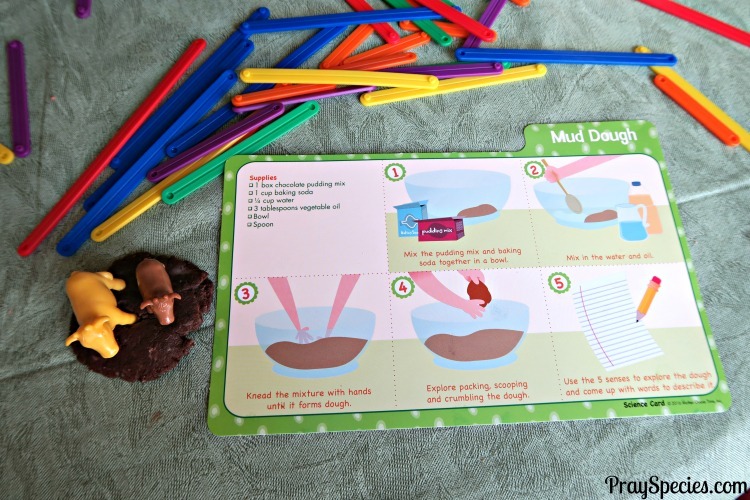 My kids had an amazing time making and playing with this mud themed dough. It was incredibly simple to throw together and we already had all the ingredients sitting in our cupboard. The dough smelled amazing and despite being taste safe was disgusting to eat, which was beneficial in helping my toddler keep it out of his mouth. 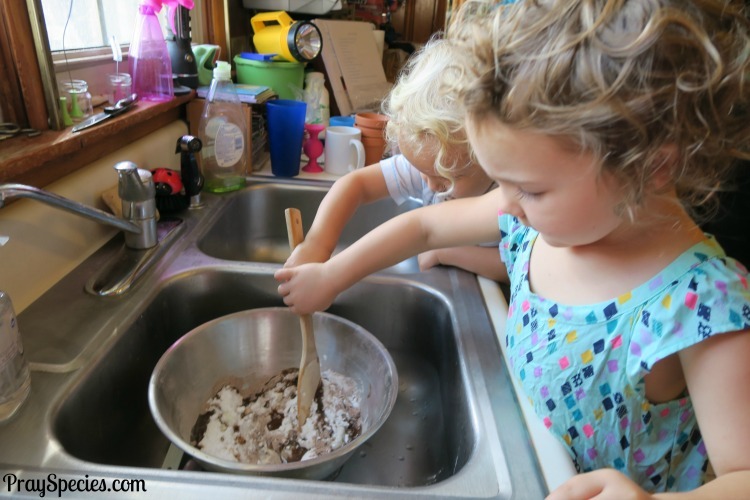 Mix the pudding mix and baking soda together in a bowl. Mix in the water and oil. 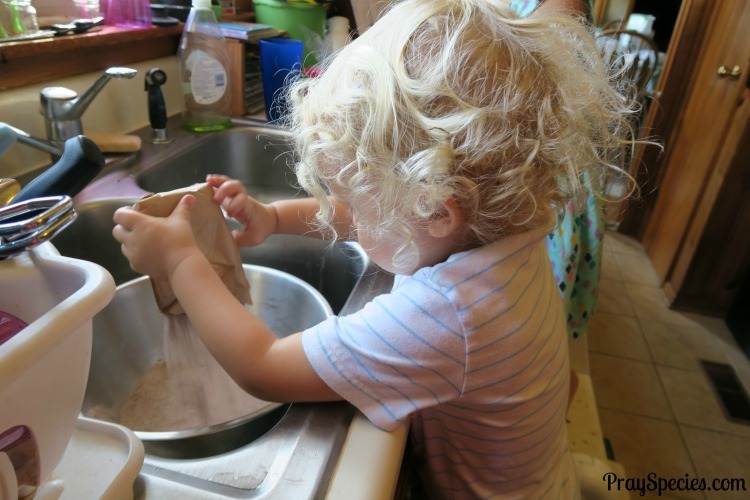 Knead the mixture with hands until it forms dough. 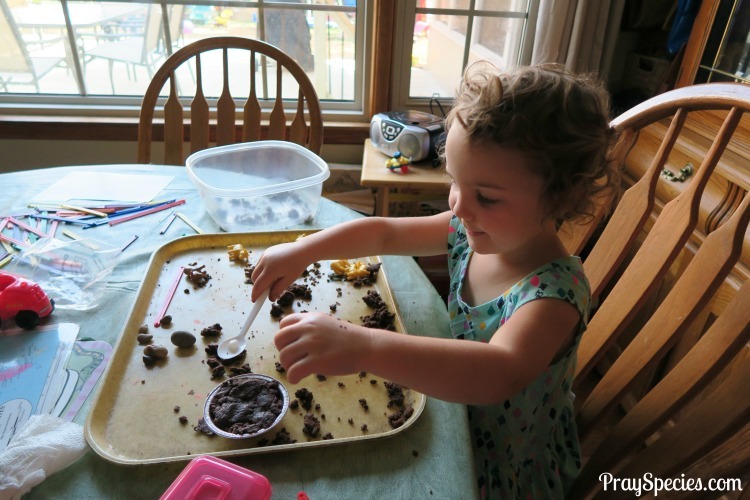 Explore packing, scooping, and crumbling the dough. 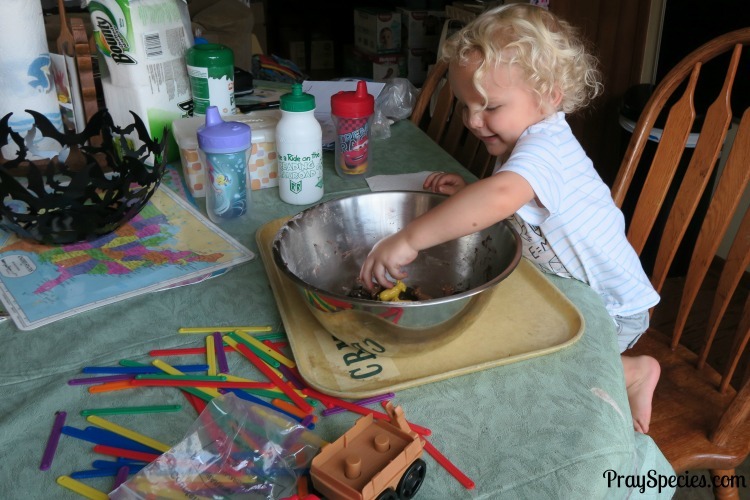 Use the 5 senses to explore the dough and come up with words to describe it. Owl added the dry pudding mix to the bowl. 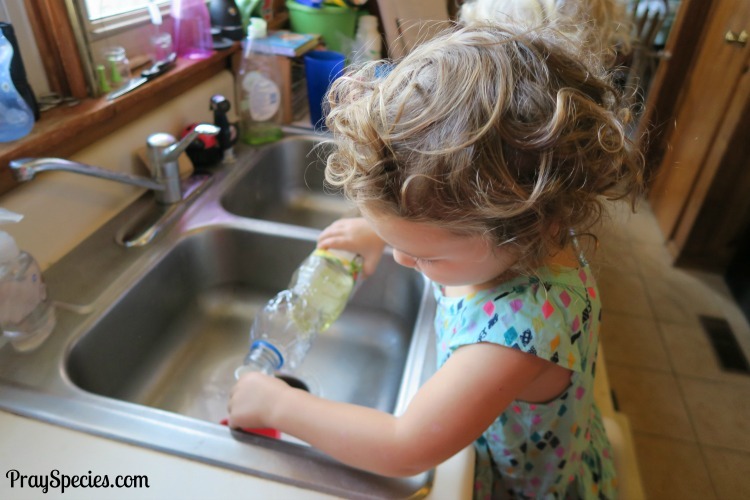 Ladybug measured out one cup of baking soda. 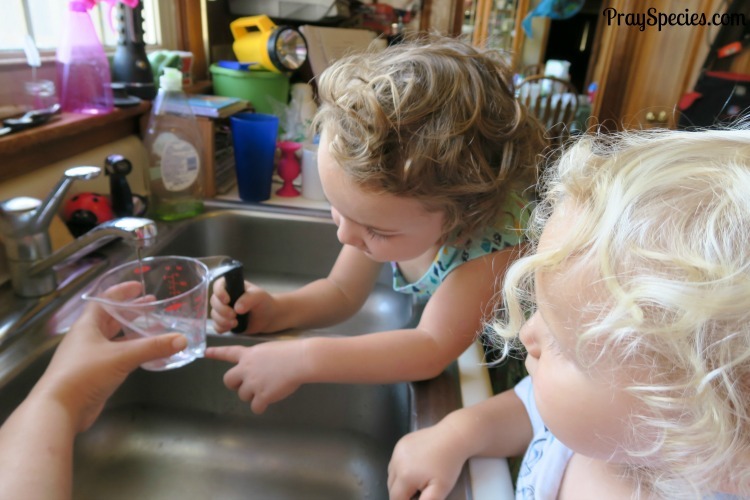 Ladybug filled the measuring cup to the 1/4 fill line with water. I was impressed that she was able to identify the 1/4 mark! It was the first time she was able to show me without me having to guide her through the process. Ladybug measured out the 3 tablespoons of vegetable oil into a small bowl. 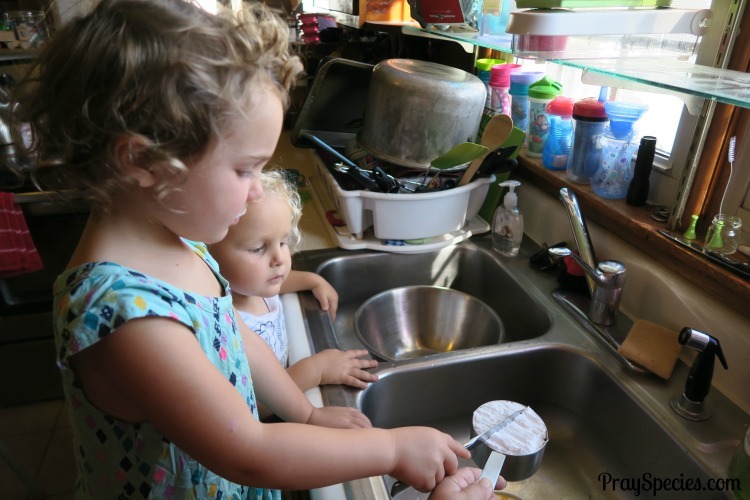 The separate bowl makes it easier to let her measure independently or with minimal assistance without jeopardizing the recipe. 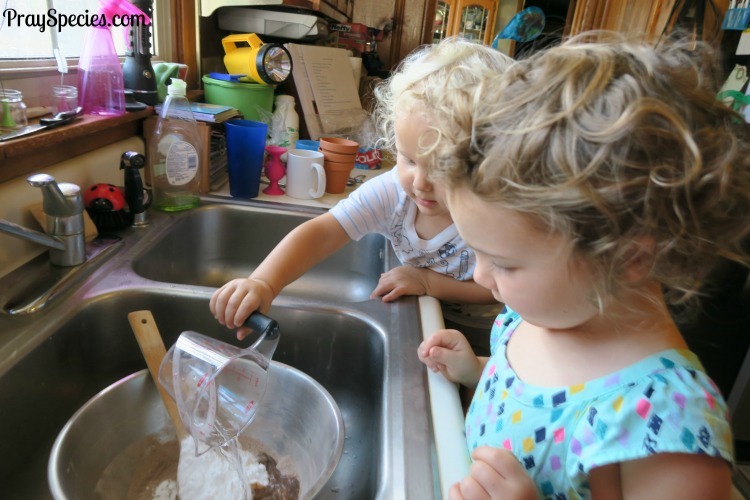 Owl and Ladybug poured all the measured ingredients (baking soda, vegetable oil, and water) into the big mixing bowl with chocolate pudding mix. The kids mixed all the dry and wet ingredients together with a wooden spoon. 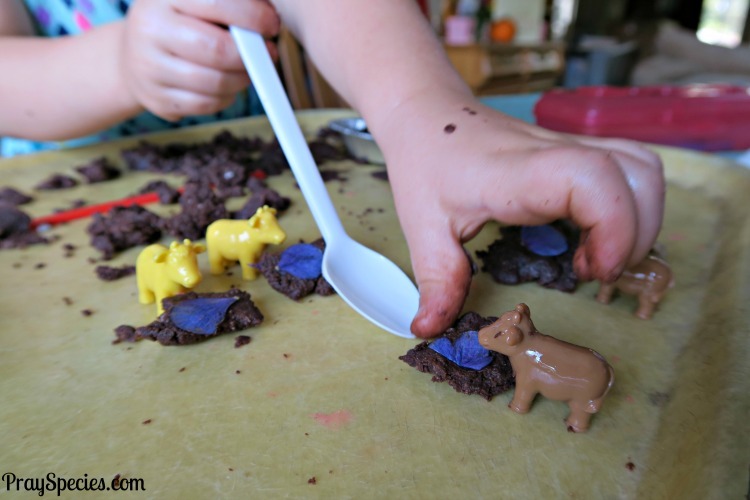 We used miniature cow figurines to play in the mud. We counted them, decided which ones were bigger and smaller, and made lots of tracks. We described the dough based on all five senses. The best sense was smell, it really was marvelous! Owl enjoyed keeping the bowl in which the dough was mixed and called it his mud hole. He kept “jumping” the cows from his tray into the mud hole. Talk about what you can make with mud. 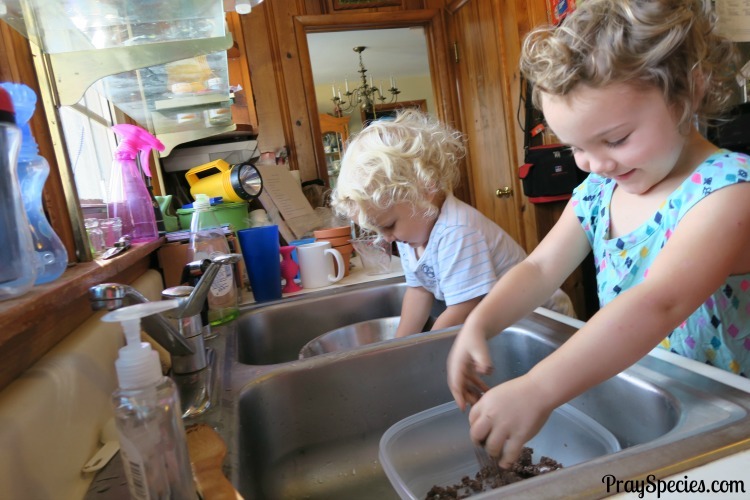 Let the kids explore the supplies and create their own mud pies. Encourage them to decorate and share their pies. Here are two additional play prompts for extending the fun and learning! 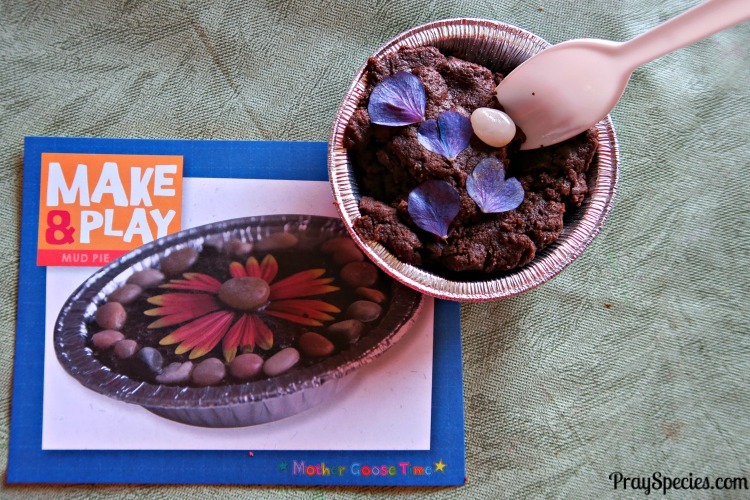 Invite children to set up a “bake sale” with the mud pies. 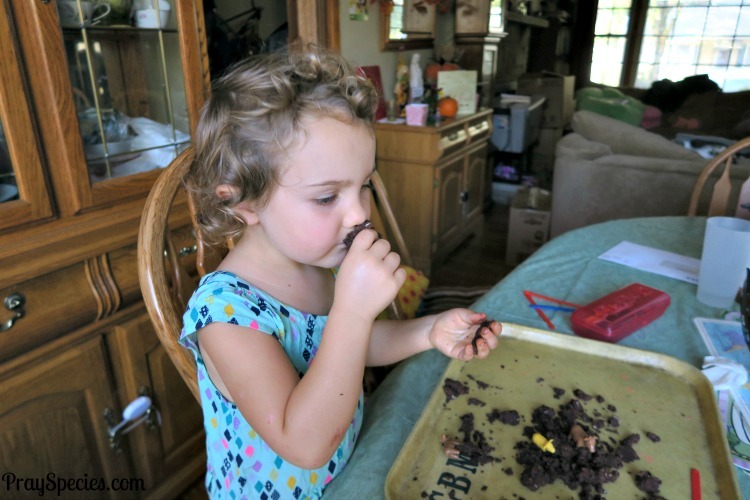 Create more mud treats to buy and sell. Create price tags and use play money to role-play baker and customer. What will children do with the money they make from the sale? An order just came in for the biggest mud pie ever! The customer wants a mud pie that is 12 inches long. Invite children to problem solve how to build a tin to hold it and how to create a pie that large. 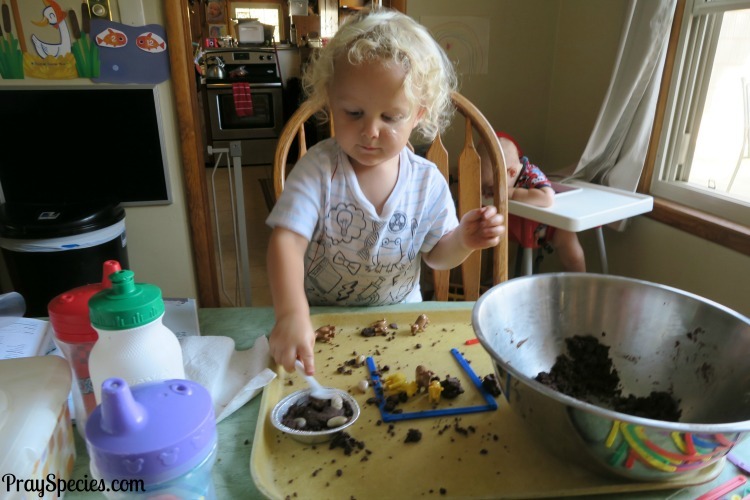 Owl loves patting the “mud” into his tin. He was happy to feed it to all the cows. The pebbles later became currency and each cow had to pay one pebble for a bite of pie. Ladybug was very interested in creating individual pie slices for her cows. She decorated with petals. She then used her spoon to evenly divide the pie and served each hungry cow a slice. She made sure each cow’s slice had exactly one purple flower petal. 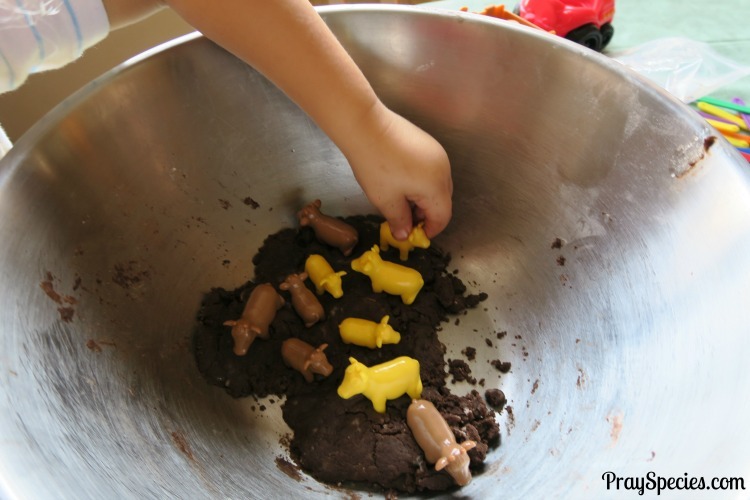 Mud Dough and Make and Play Mud Pie are activities inspired by Mother Goose Time’s “Down On the Farm” Unit. 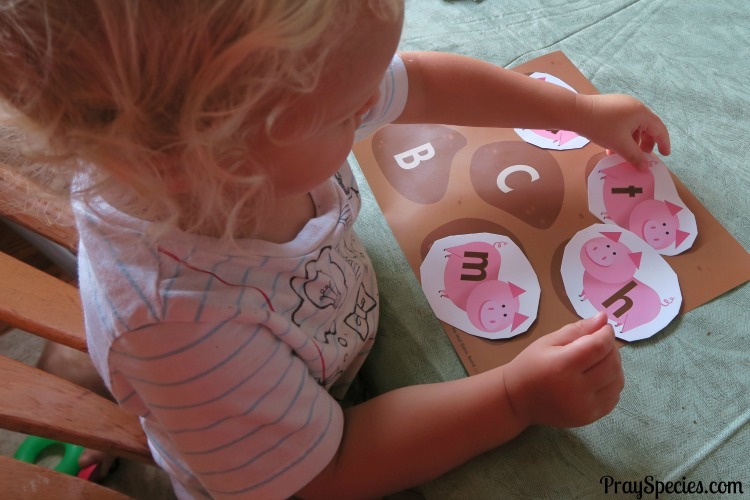 As an ambassador for Mother Goose Time we are delighted to share additional activities such as the letter match game shown above on Facebook and Instagram! Join us for some more farm themed fun!